Siraj Wahhaj (Jr), a fugitive from justice (flight risk), killed his handicapped son and kidnapped numerous other children, yet was released from custody with a pre-trial bond of $20,000 and an ankle bracelet. Wahhaj is a jihadi. The vast majority of government officials still have no idea what that means nor do they understand the threat Islam poses to local communities across America. Government leaders fail daily to target jihadis (“terrorists”) and, therefore, fail to protect the very citizens for whom they are responsible to protect. This is all about Sharia. In December 2015, an “Oral Fatwa” was issued by the Sharia board of the Islamic State authorizing its members to “kill newborn babies …and disabled children.” The Fatwa was issued by Saudi sharia judge Abu Said Aljazrawi. On August 3, 2018, a search warrant was served on a compound in Costilla, New Mexico giving police the authority to search for an abducted 3 year old named Abdul-ghani (AG) Wahhaj, the son of Siraj Wahhaj (Jr). AG Wahhaj was handicapped, suffered from seizures, and could not walk. AG Wahhaj’s remains were found on the compound. When officers initially entered the compound, Siraj Wahhaj (Jr) refused to follow verbal direction, hid from officers, and was armed with an AR-15 rifle with 5 loaded 30-round magazines, and 4 loaded pistols, including one in his pocket. Many more rounds of ammunition were found in the compound, which consists of a small travel trailer buried in the ground covered by plastic. Four other adults, Lucas Morten, Hujrah Wahhaj, Jany Leveille, and Subhannah Wahhaj were also arrested. Eleven children ranging in age from 1-15 were found on the compound which had no water, plumbing, or electricity. Last week one of the women passed a note to her family in Georgia pleading for food and water. This was the tipping point that moved the Taos County Sheriff Department to serve the search warrant. Taos County Sheriff Hogrefe conducted a two month investigation with Clayton County, Georgia and FBI investigators attempting to locate AG Wahhaj. According to Sheriff Hogrefe, the FBI had recently provided information on this location, but did not feel there was enough probable cause to search the property for the boy. Does the FBI know about the Fatwa? Prosecutors advised Siraj Wahhaj (Jr) took weapons classes in rapid succession and then traveled to Saudi Arabia last year. The prosecutor in the case presented information to the court including the fact that Lucas Morten gave Siraj Wahhaj’s (Jr) brother Mohammed (sic) a letter which prosecutors believe was likely written by Siraj Wahhaj (Jr) which states, in part, “Allah says he will protect you always, so follow until he makes you die as a martyr as you wanted. And the only way is to join the righteous (“us”).” (Islam/sharia teaches the only way for a muslim to guarantee they will go to paradise is to die as a martyr). Sheriff Hogrefe said at least one of the children were armed and wearing a holster when the search warrant was executed. The boy was told to “arm up.” Several guns were in reach of the children. (Under sharia, muslims are not required to obey police who are not sharia adherent). The prosecution advised the children were taught teachers, military, law enforcement, and financial institutions are enemies. Children had advanced weapons training with the purpose of resisting the government. (Sharia requires muslims to overthrow all governments which do not enforce sharia in the land). Defense attorneys continued to argue that if the perpetrators had been “white and christian” they would not be at the court. Siraj Wahhaj (Jr) is the son of Imam Siraj Wahhaj, an unindicted co-conspirator in the 1993 World Trade Center bombing who openly calls for sharia to be implemented in the United States. As we see with most terrorists like this, on June 25, 1991, Imam Siraj Wahhaj became the first muslim to offer an invocation in Congress. Siraj Wahhaj (Jr) is the son of a sharia-adherent muslim (jihadi) who is an Imam and an unindicted co-conspirator in the 1993 World Trade Center bombing who calls for the overthrow of the United States and the implementation of sharia. Evidence obtained by authorities reveals this is an Islamic group which seeks to wage jihad and attack non-muslim targets using children. Evidence reveals AG Wahhaj died on the compound. The police, FBI, prosecutors, judge, and media appear to have no understanding of Islam/sharia and how it drives adherents to act the way they do. The entire leadership of the Islamic world is pursuing a line of operation that stands in direct conflict with U.S. founding principles and law. 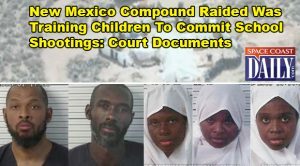 Lucas Morten, Siraj Wahhaj, Hujrah Wahhaj, Jany Leveille, and Subhannah Wahha abused children, and were involved in the abduction and murder of a 3 year old boy. These crimes are lawful under Sharia. Judge Sarah Backus concluded the 5 Jihadis were not a flight risk or a threat to the community. If the FBI or the local police had been trained by UTT (Understanding the Threat) they would understand AG Wahhaj – a handicap child – would be killed when he was abducted. They would understand these 11 children are being trained to kill under sharia. If Sheriff Hogrefe or the FBI knew sharia they would have been able to articulate facts leading to probably cause to obtain a search warrant for the compound long before they did. Then they would have been able to return AG Wahhaj alive to his mother. Do not allow yourself to feel helpless. Get involved! Help UTT educate police, judges, prosecutors, and many others who need a dose of the truth. Get educated. Sign up for UTT’s newsletter on our website. Follow us on Facebook and Twitter (@UTT_USA). Subscribe to our YouTube Channel. Use the Resources on our web site. Bring UTT’s Training to your town. UTT is the only organization in America with a 3-day program for Police, national guard, and first responders that shows them how to proactively locate jihadis, map out the jihadi network, and create investigative strategies to rip out the jihadi network from your neighborhood. Support UTT Financially. Donate on our website to support bringing a training program to your area or to generally support the work of UTT. Sponsor a law enforcement officer or youth to attend UTT’s Train the Trainer program. Go to www.UnderstandingtheThreat.com now and sign up. We need your help to put freedom back on the offensive where it belongs! Because it isn’t our Judicial system anymore. Not for some time actually. Since too (with but a dearth of noble exceptions) the current cabal of judicial “leaders” UTT also references, literally live amid multiple concentric circles of high-tech security, as do, rest assured, their loved ones; in the existing void created by the disappearance of the U.S. Attorney General, aka “Milquetoast” on stilts, and the criminally negligent assertion by the FBI that the hideous situation they discovered, according to UTT’s foregoing narrative, lacked any probable cause which would have required federal enforcement action, the Special Agent in charge of the bureau’s thus cursory participation in the case should obviously undergo a comprehensive de-briefing. Considering too, as the country slips ever deeper each day into an obvious Constitutional crisis, that a misfit and anarchical Special Persecutor, whose prior actions in the run-up to & immediate aftermath of, 9/11, and on one separate occasion since, have violated both Article-3 of the 14th Amendment (regarding the provision of aid to the enemy in time of war*), and the 8th Amendment (with respect to the infliction of cruel and unusual punishment on an incarcerated unindicted American citizen) it seems fair to say that the future is dim. And until the so-called “28 pages” of the 9/11 Commission Report are revealed to the public along with the grotesque series of other political cover-ups which date from as far back as WW-1 and have collectively maintained a stranglehold on the country’s wellbeing and ability to report the truth for decades to the American people, the type of gathering disaster UTT has reported above will become common place and effectively controlled by the sharia-adherent Islamic savages who have been enabled to embed themselves across the entire breadth of the United States government. *In the meantime its important to remember that the only thing now enabling American families to sleep peaceably at night is the knowledge that rough men on distant battlefields and dark city streets stand ready to do violence when & where need be on their behalf. Anyone wishing to have a personal translated verbatim copy of Islam’s declaration of war on the U.S. which was seized in compliance with a federal search warrant from a subterranean basement in Annandale, Virginia, in 2004, by Special Agents of the FBI, may (for a nominal handling & postage fee) contact http://www.securefreedom.org to request: GOVERNMENT EXHIBIT 003-0085 3:04-CR-240-G U.S. v. HLF, et al. To know that the majority of government officials still do not know the word jihad and the laws of sharia and it’s dangers….is frightening to the core….we are now at a turning point against a huge wave of ignorance that is now being unfolded thanks to the work of so many who did excellent study and analysis on the tedious details of the deception. This case in New Mexico couldn’t have landed in a worse court, it shows the dangers we have faced the last forty or so years as the movement landed on our shores and found fertile ground of the like minded to bring this clever doctrine to threaten our way of life, hiding in plain sight.But the news of removed security clearances may bring the catalyst to see the whole picture of a collusion of the unknown entity of the worst sort.